Now with micro-magnetic blade fixation! 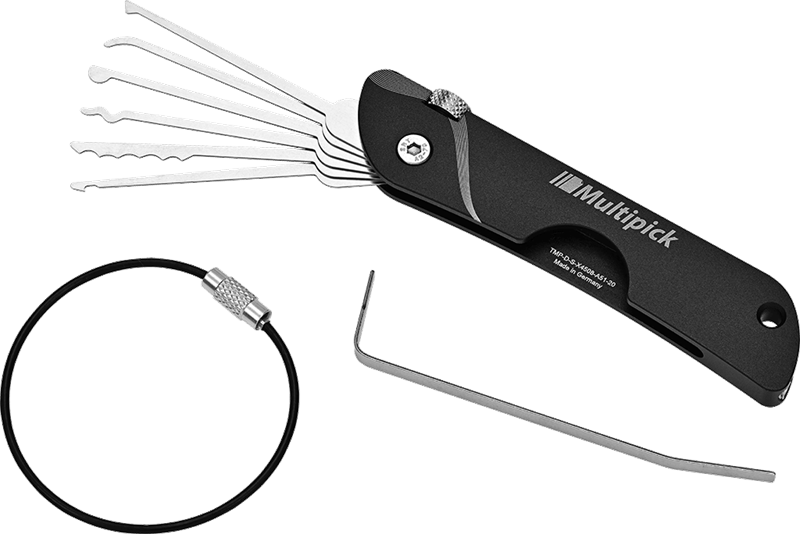 Small, handy and highly functional - The new Jackknife pocket pick set blackline edition from Multipick. We were able to develop this popular tool, designed with some essential characteristics and significantly improve its functionality and efficiency. Thanks to the micro-magnetic blade fixation in the new 2018 model, it is no longer possible for the pick blades to slip out. 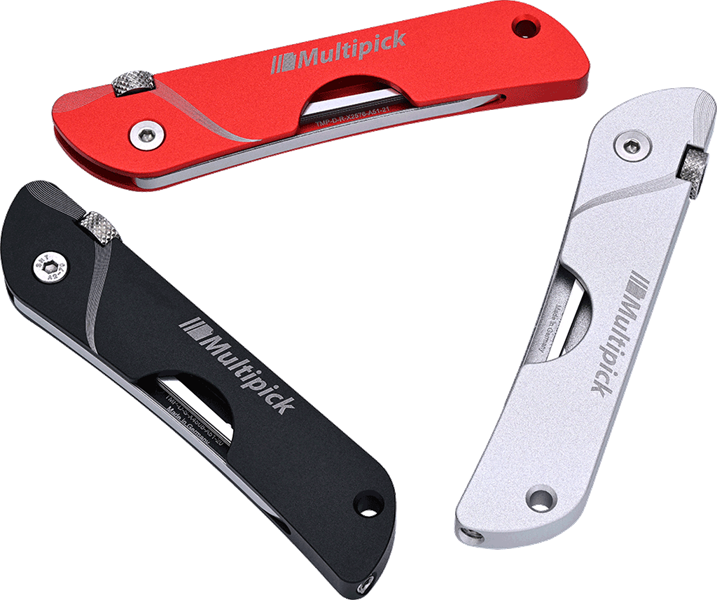 The new Jackknife pocket pick set fashioned in form of a Pocket Pen Knife is available in three different versions: Black, Red and Silver. An amazing look combined with extraordinary finishing makes it a special lockpick tool. This pick set is cut from an aluminum block, has been galvanized and repeatedly treated to a special micro-finishing. It is a real eye catcher and a great everyday carry lock pick kit, weighing just 26 gram when compared to other similar products from the USA, which are manufactured in low-wage countries like China. The different picks are made of German High-End spring steel of extreme hardness but still provide the necessary flexibility. The German heavy-duty steel, which we use, is a highly hardened and tempered metal alloy, unique on the world market. To our knowledge, there is no other producer - other than Multipick, who uses such a high quality material for pick manufacturing. All picks and the inbuilt tension tool have been fine-tuned to enable the picking of even narrow cylinder keyways. The blade is only 0.5 mm thick. The inbuilt tension tool may be removed and replaced with a light sliding movement; thus, making it a real tool to work with. The different pick versions are fixed with a knurled screw and guarantees a 100% safe hold. In addition to its very light weight, you also get a workable picking process with a very good feedback through the handle. The possibility of changing the picks in very short time is an added advantage to our new product design. You simply have to loosen the Allen screw (2 mm). With the optionally available single picks, you may select your own individual pick set. 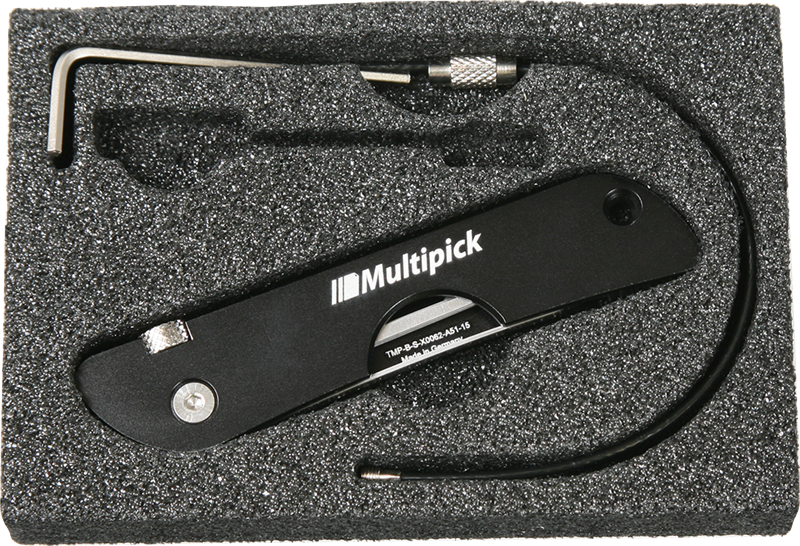 Whether for yourself, as a gift, for geocaching or for Special Forces of different sectors, the original Jackknife pocket pick set from Multipick is simply a safe and reliable companion for all situations. All in all a top quality tool, this will delight even professional Lockpickers. 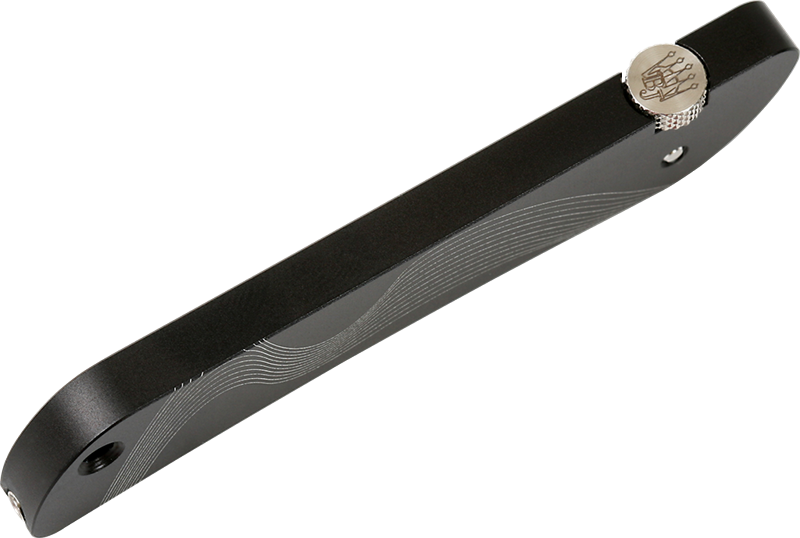 We would be welcome to engrave your Jackknife pick set with your company logo or other. Your special production is already possible as from 1 piece. The quality of this jackknife kit is excellent. I’ve tried with my training lock and picked a low security cylinder with it. Good for emergencies & everyday carry. Recommended. 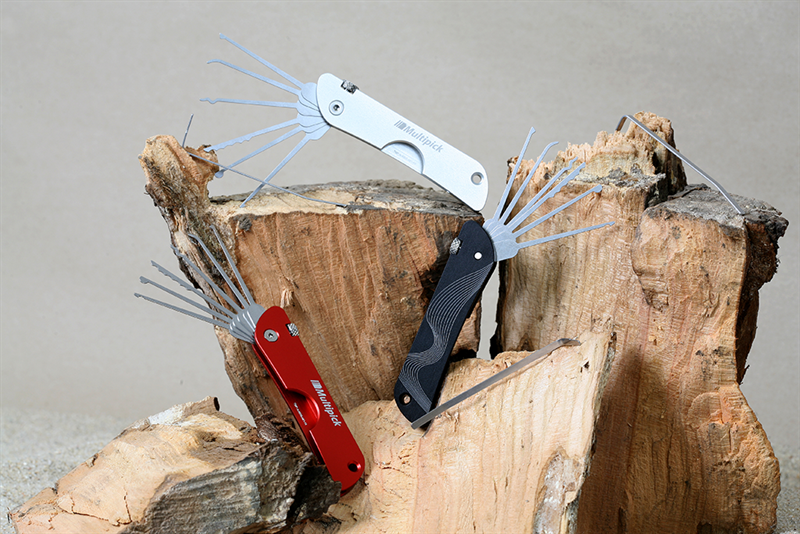 Compact six blade stainless steel pocket knife lock pick kit. Sleek smooth finish looks good for any style. Very handy and works great on padlocks. Yet to test on other locks. It seems to be good quality and I'm hoping will last a while, definitely doesn't seem like cheap Chinese junk. A must for any EDC collector. Very happy with product. I bought a cheap set before and now I can feel the difference in quality tremendously. Man, you should never buy cheap stuff. Kit was delivered very fast. Super quality which I have been waiting for years. Since I am already professionally picking locks for the past 15 years, I can say that, I´m totally satisfied when I shop at Multipick and I highly recommend their products. Keep it up. Super Quality - highly recommended! I have often thought about buying a lock pick Set. Personally good quality and good service is very important to me. So I decided to go for the black version of Multipick´s jackknife pick set. The delivery was very fast and I had the goods within few days. The workmanship is as expected of very high quality. The picks are made of thin spring steel and it fitted into every lock I tried so far. The set is small, compact and therefore fits easily to any key chain as well to any trouser pocket. Another great thing about this kit is, if a pick is bent one can replace it without any difficulty. For the moment I got small simple locks and therefore I cannot say much about picking, since I\'m only starting. Conclusion: I definitely recommend this pick set. Anyone who attaches importance to quality and good service, then you´re in the right place.